VC CoLAB is proud to support the SUSTAIN VC ballot initiative that is in the process of gathering signatures throughout Ventura County. The campaign needs more volunteers and donations to help us reach our goal of around 30,000 signatures by mid-May. 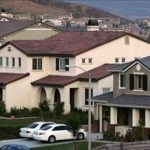 Please visit our website at www.SUSTAINVC.org to sign up for a petition to circulate to your friends and neighbors, join our growing list of supporters, make a donation, and of course to find out more about the initiative. We are proud of the three local farmers, Phil McGrath, Patty Waters and John Lamb who filed the initiative because they know, if you really want to sustain agriculture in Ventura County, farming must be economically viable. These proponents who have sponsored SUSTAIN VC and their families have collectively farmed in this community for over 400 years. While stopping urban sprawl is as important to farmers as anyone, they know that farmland is more than just a beautiful view. CoLAB is helping by sponsoring the campaign committee and filling requests for speaking engagements along with the proponents. The campaign team has been formed and is working feverishly to get the SUSTAIN VC message out. Our staff is providing some assistance while we continue on the many projects we support to benefit our members. 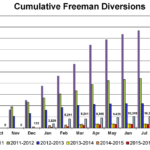 The idea was hatched over two years ago by a group of local farmers and ranchers who were concerned about the unintended consequences of the “SOAR” (Save Open Space and Agricultural Resources) initiatives that are planned to be renewed for 34 years to 2050 on the November 2016 ballot. While SOAR has been asserting that their measure saves agriculture and is good for farming, most farmers disagree. So an agricultural working group of farmers and ranchers came together and began researching the initiatives, with the help of VC CoLAB as a policy consultant. 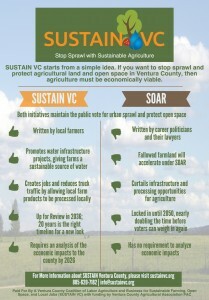 SUSTAIN VC is an alternative to the countywide SOAR initiative. While there will also be eight city initiatives up for renewal (Ventura, Camarillo, Oxnard, Santa Paula, Fillmore, Moorpark, Thousand Oaks and Simi Valley), the agricultural working group did not propose alternatives for these. For cities, we believe that the residents must have an opportunity for input into their urban growth boundaries through the general plan process with leadership from their elected city councils. It is up to the city councils to oppose the 2050 SOAR sunset date if it exceeds the horizon of their general plan. But in the unincorporated county, outside the urban boundaries, there are roughly 200,000 acres of agricultural lands that through the SOAR initiatives are required to stay in agriculture without a public vote. And, in the proposed countywide SOAR initiative, goals and policies that govern agricultural opportunities cannot change without a countywide public vote until 2050. Ventura County agriculture is facing unprecedented challenges: drought, crop loss from new invasive pests, encroachment of urban neighbors including schools, lack of workers and housing, lengthy and inefficient processes for infrastructure upgrades and international competition. Technology is rapidly changing and farmers are questioning the ability to stay economically sustainable for the next 34 years with the weak goals and policies regarding agriculture in the existing county general plan. The lack of strong policies supporting agriculture puts these lands at risk. 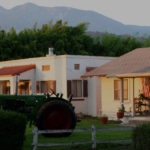 Most Ventura County farmers are local and have owned their land for generations. They want to farm, not sell off their land. But fallowed and barren land will be targets for public votes to allow sprawl. So how does SUSTAIN VC propose to stop urban sprawl? Keeps the requirement for voter approval before agricultural and open space lands can be redesignated for urban development. Adds strong goals and policies to the County General Plan to support the economic sustainability of agriculture, thereby helping farmers resist pressure to fallow agricultural land or sell their farms to developers. Adds three allowances and provisions to strengthen agriculture in Ventura County. 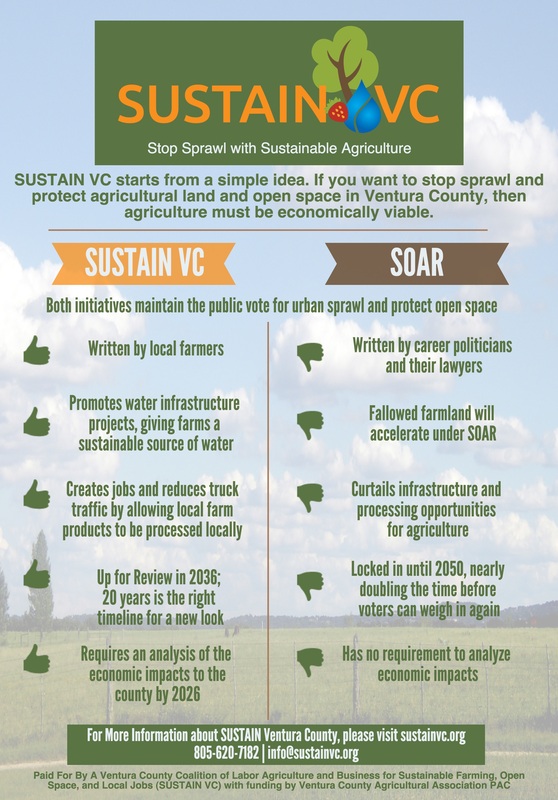 While SUSTAIN VC keeps the requirement for voter approval and has the exact same goals and policies as SOAR 2050 to protect open space; it will be a game changer with respect to keeping agriculture viable in Ventura County. SUSTAIN VC has been endorsed by the Tri-Counties Central Labor Council, representing 70,000 members in San Luis Obispo, Santa Barbara and Ventura counties in California. Union laborers are volunteering to gather signatures with the message: “Grow Green Space and Jobs”. VC Coalition of Labor, Agriculture and Business – Membership includes 250 farmers, ranchers and agricultural support businesses countywide. VC Agricultural Association – Membership consists of farmers, packers, shippers, labor contractors, nurseries, and agricultural related businesses countywide. VC Cattlemen’s Association – Membership consists of ranchers, farmers and agricultural support businesses countywide. California Women for Agriculture Ventura County – Members consist of farmers, farming advocates and consumers. Thank you to all of our farm community and small business supporters who are helping to get our message out about SUSTAIN VC! Our quality of life in Ventura County is infinitely connected with our agricultural green spaces which will only stay green with the success of SUSTAIN VC.